Prescription Drug Authorization is required to purchase this item. We will only process an order including this item if we have an Rx Drug Authorization form from you. If you would like us to process the unrestricted items in your order, please indicate this in the "Special Instructions" field during the shipping section of checkout. You can download our Prescription Drug Authorization form here. Adobe Reader is required to view the form. Get Adobe Reader free here. 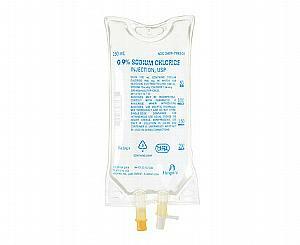 0.9% Sodium Chloride Injection USP is indicated for extracellular fluid replacement, treatment of metabolic alkalosis in the presence of fluid loss and mild sodium depletion.